When my husband lived off-campus during his college years, he and his roommate used to make quick “manly food” for good academic nourishment. The dishes they would make and share often involved meat, onion, spice, and some way to hold it all together. 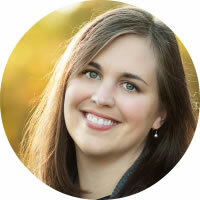 One of their favorite creations was a Savory Pie recipe. Well, actually, they called it Hamburger-Onion Pie, but they were boys and didn’t care and I wanted it to have a name that sounded classy 🙂 The two of them loved it so much that they could polish off the entire thing for dinner before heading back to their studies. 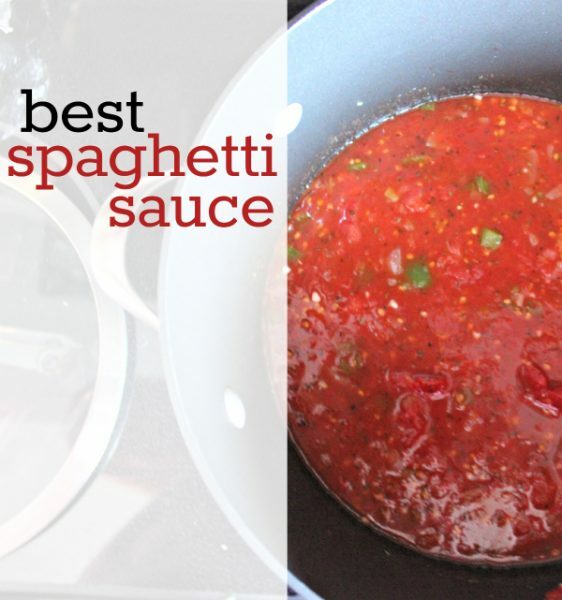 Pair it up with creamy mashed potatoes and something green and you’ve got yourself a hearty family meal! 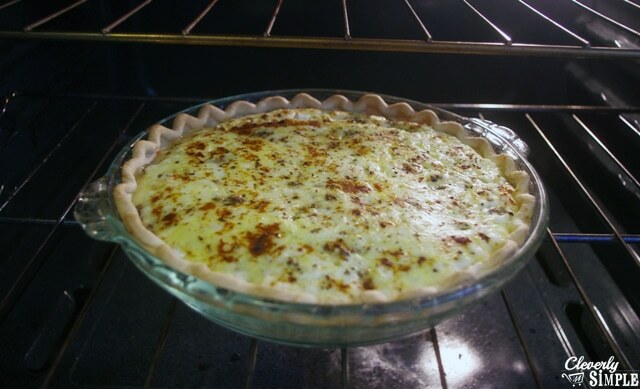 Savory pie is savory because there is nothing sweet about it …and it is a pie because it includes a pie crust. Normally, I try to make my crust to save money, but Kroger had a sale this past week on refrigerated pie crusts that I couldn’t pass up! It took just 15 minutes to make the pie and the end result did not disappoint. 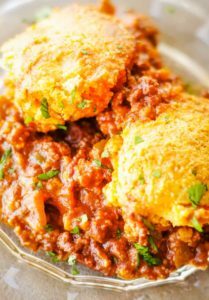 The best part about this recipe is that you can use your favorite ground meat (we are using venison!) and also your family’s preferred spice. 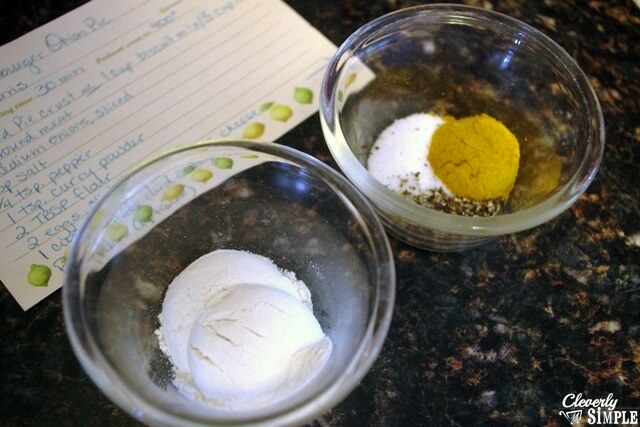 Garlic powder, chili powder, oregano, cumin, curry powder (our choice!) 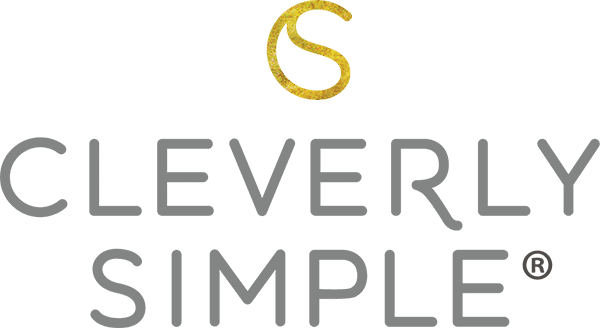 would all work or if they like things on the plain side, simply leave the 1 tsp. of spice out. 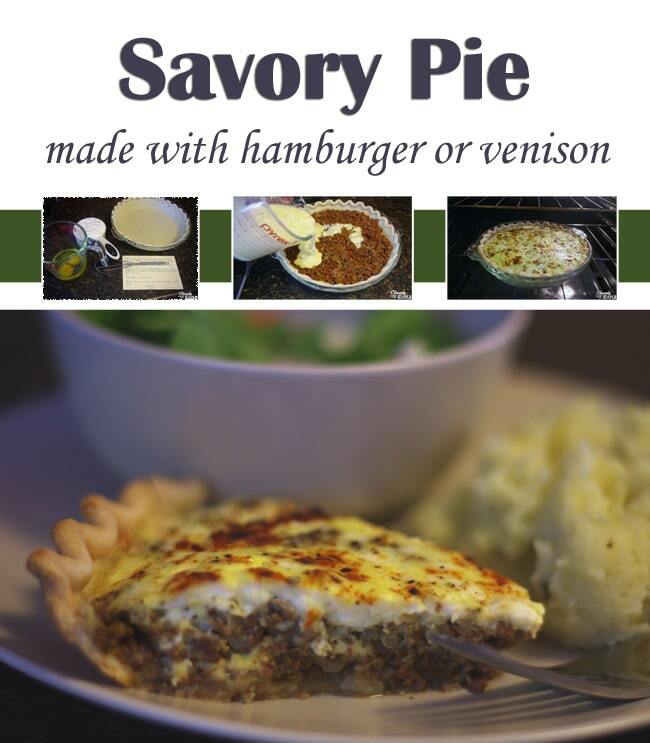 Allow me to introduce to you Savory Pie – a simple and delicious all around recipe for those who enjoy a good hearty meal. Here are the stars. 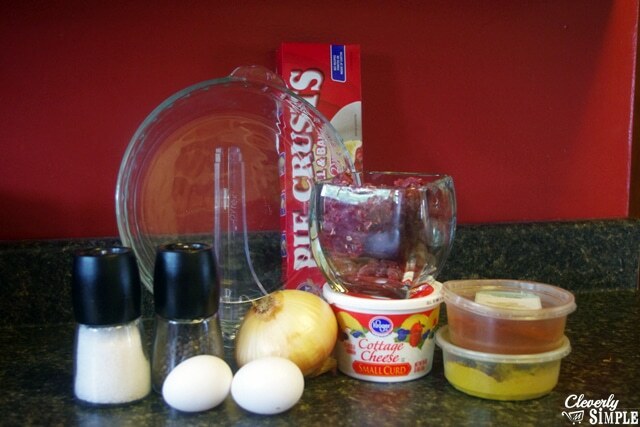 Just seven ingredients : meat, eggs, onion, cottage cheese, spices and pie crust. The only thing I forgot to include in the picture was flour. Silly me. 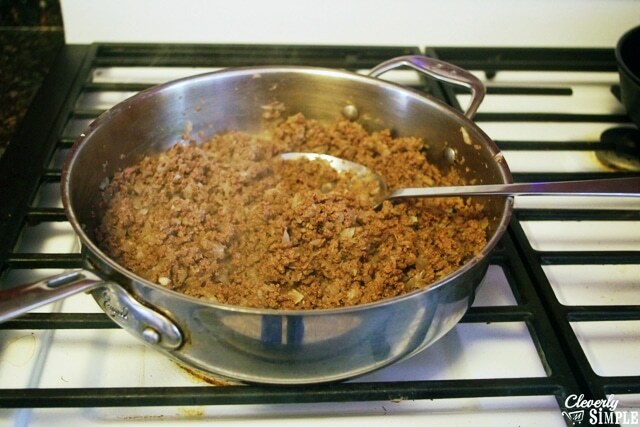 In a large skillet, brown 1 lb of your favorite ground meat with 1 cup of chopped onion. Add a little salt and pepper like a pro. As the meat is browning, take a fork and mash it up nice and fine with the softened onion. If there is lots of liquid fat, drain it off to your liking until you get a picture similar to this! …seriously, there is nothing better than the smell of sauteed meet n’ onions! Stir it all together while the meat is still hot. 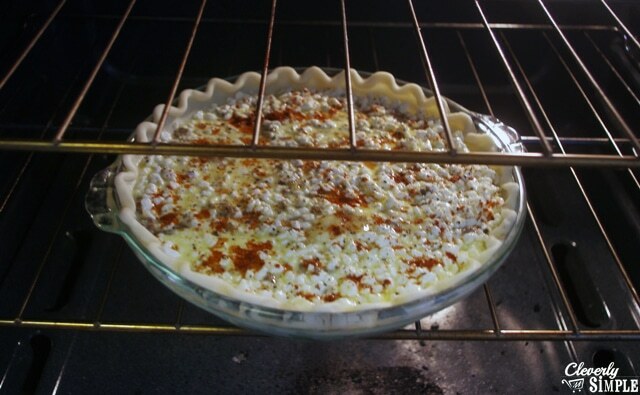 Roll out your unbaked pie shell, crack two eggs and spoon out 1 cup of small curd cottage cheese. In other words, act like Iron Chef! 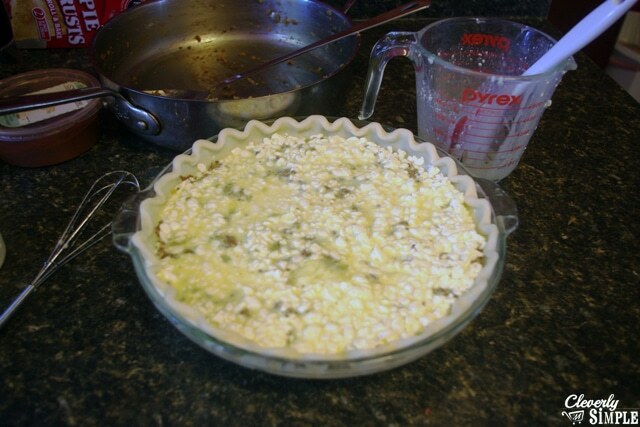 Spread the meat mixture into your pie shell. Then, whisk the eggs up with the cottage cheese and some more cracked black pepper. Now here comes the artsy part. Pour the egg and cheese mixture over the meat, BUT do not mix. 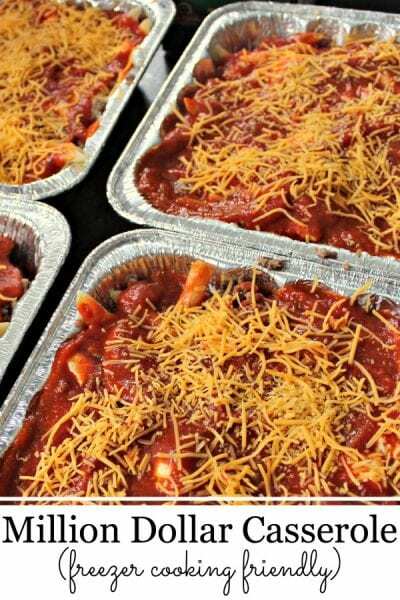 In the oven, this topping will help to keep the meat moist and create a layer affect. Here is what it will look like before sticking it in the oven! Sprinkle it with some paprika (optional, bro!) and pop the pie into a hot 400 degree oven for 30 minutes. Here we have it folks! 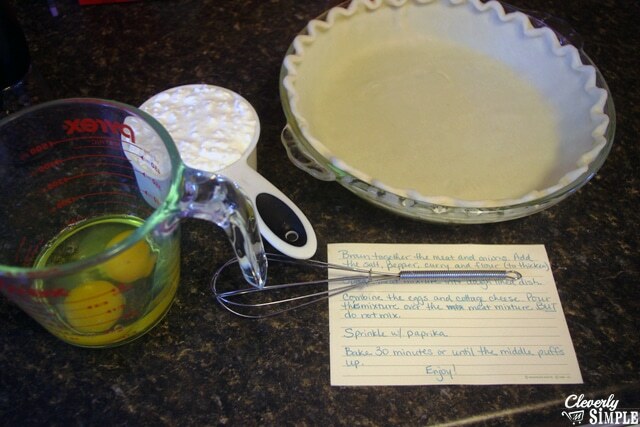 Scrumptious, simple, savory pie. Literally, it’s good enough to savor every single bite. 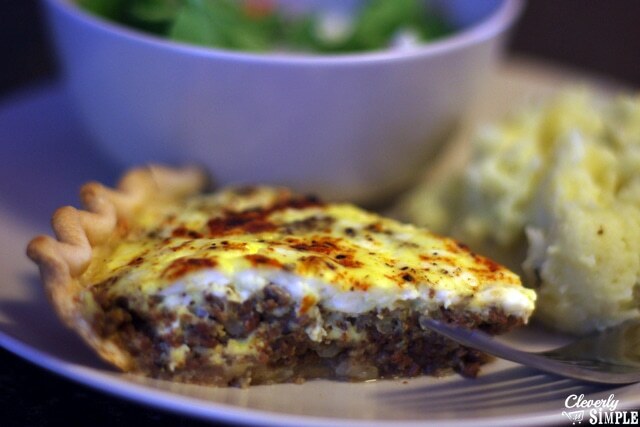 Make this delicious savory pie for dinner using venison! Brown 1 lb of ground meat with 1 cup chopped onion. Add a pinch of salt and pepper. 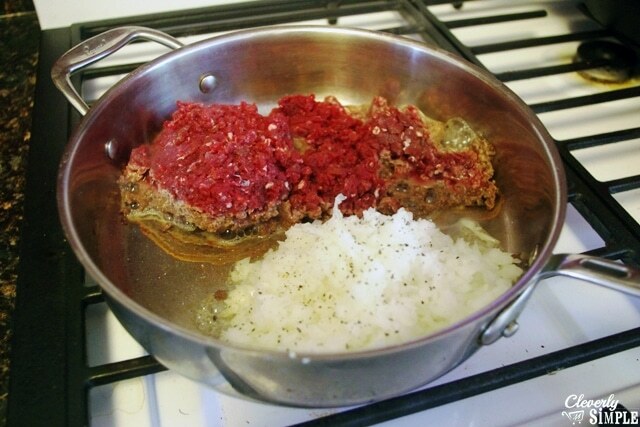 Turn off heat, mash down meat so that it is extra fine and drain off liquid fat. Stir in 1 tsp. salt, 1/2 tsp. cracked black pepper, 2 T. flour and 1 tsp. of your favorite spice. In other bowl, whisk together two eggs, 1 cup of small curd cottage cheese and more cracked pepper. 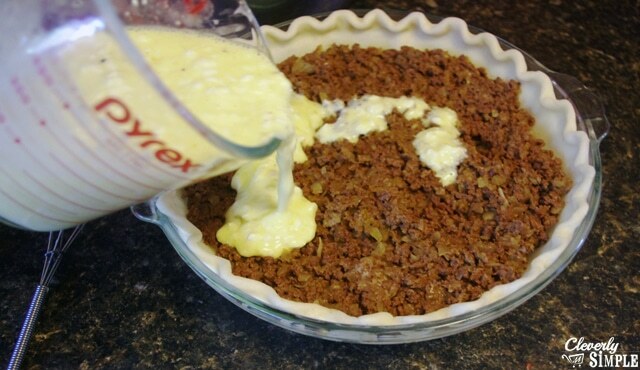 Spread the meat mixture into your unbaked pie shell. Pour the egg and cheese mixture over the meat, but do not mix. Sprinkle the pie with paprika (optional) and bake in 400 degree oven for 30 minutes or until the middle of the pie puffs up. I have searched my mom’s old recipes for this. I remember it growing up. I knew it used cottage cheese and paprika on top. I am 62. Finally I found yours and this is it! I asked my sister “what can feed 6 kids using 1 lb of ground beef?” This is it. This recipe is from an old 1950’s cookbook. 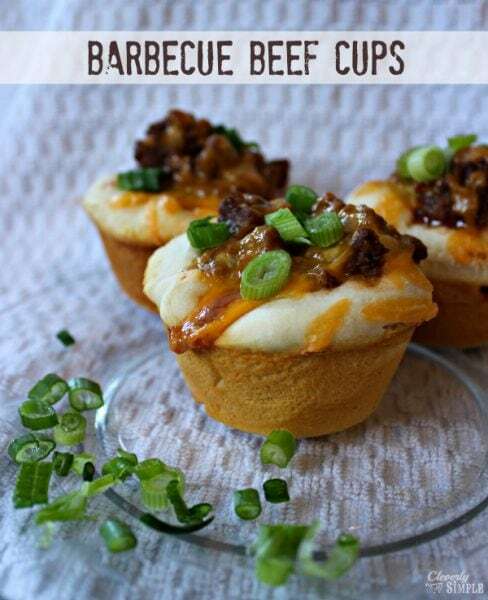 He did not invent this..and it is called hamburger onion pie..crust made with bisquick. Lol..too funny.. I stand corrected. Didn’t realize that he didn’t create the recipe. I asked him about it and he said his mother had a similar recipe and so did his grandmother. I suppose 60 years is plenty of time to lost track of its origin. Would be interested to see if the 1950’s version had curry powder? Anyhow, thanks for your insight!